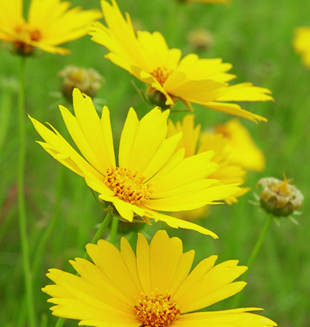 A perennial species that often acts as a short-lived perennial, Tickseed Coreopsis grows and blooms early in the spring; it also has green leaves in the fall and winter. It often blooms the second year in a planting. The common name for this species refers to the resemblance of the seeds to ticks. The Latin name Coreopsis also refers to the seeds of this genus resembling a bug, and lanceolata refers to the lance-shaped leaves. Lance-leaved Coreopsis is another common name for the species as is Sand Coreopsis, which refers to its affinity for dry sites. Tickseed Coreopsis is a favorite with deer in the fall and winter. Other mammalian herbivores including rabbits and groundhogs also eat the foliage. Goldfinches and other birds find the seeds to be delectable. A bee species, the Coreopsis Bee (Andrena beameri) depends on Coreopsis species as their primary pollen source. A host of other insects from bees and butterflies to beetles and wasps visit the flowers for nectar and pollen. Yet other insects, including the Coreopsis Leaf Beetle (Calligrapha californica coreopsivora), consume the plant leaves and juices sometimes to the point that they can harm the plant population. Tickseed Coreopsis has a growth curve similar to that of the cool season grasses; it greens up with the fall rains, stays green throughout the winter, and is one of the first plants to grow again in the spring. This species does best in well drained sites that have limited competition from other plants. It does well on poor soils and is a great addition to wildflower meadows planted on poor, dry sites; it will often bloom the second growing season. Blue Indigo is a pretty partner for this species. Tickseed Coreopsis is a great cut flower. Prompt deheading of flower stalks following bloom can encourage additional blooms. "I love it dry" is this plant's motto in natural communities. It is found on glades, sandy soils, and other dry sites. It does best where there is minimal competition from other vegetation. It is a great addition to restorations on dry sites as it is quite at home and will often bloom the second year. It can be added to restorations on mesic soils as well, but it often does not persist.